Registration is Now Open! REGISTER NOW. BLD PNW is the largest gathering of Certified B Corporations in the Pacific Northwest. The event is organized by the B Corp community, for the B Corp community. By inspiring and connecting B Corps in the Pacific Northwest and their teams, we build a stronger movement to use business as a force for good. The third annual BLD PNW will be held at the beautiful new Redd on Salmon event space. The Redd is a multifaceted project of Ecotrust that was formulated to support a more equitable, restorative, and regenerative food system in the Pacific Northwest. Redd East is a newly renovated, uniquely industrial venue space that blends historical charm with a bright, modern feel. With a main hall that can seat over 500 guests, the sky is the limit with The Redd for BLD PNW. 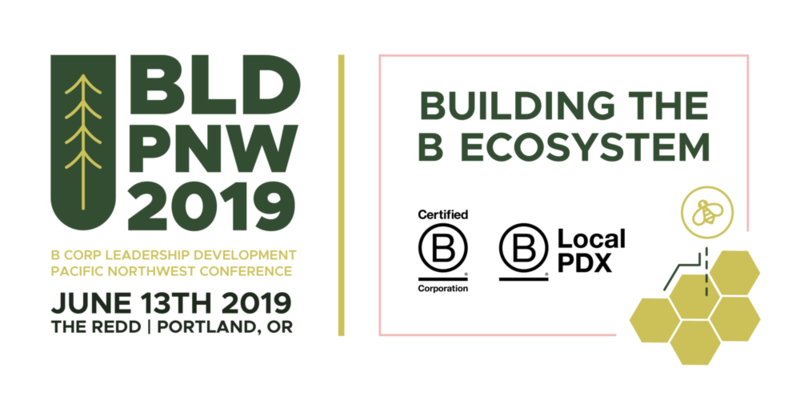 We are excited to bring BLD PNW to a venue that shares our B Corp values and is run by our colleagues at Ecotrust. We are seeking both financial and in-kind sponsors for BLD PNW. Want to support? Learn more about sponsorship here. This conference is geared mainly toward Certified B Corporation companies, and a limited number of tickets are available for others in our values-aligned community, such as students, academics, non-profits organizations, benefit companies, and aspiring B Corps. Register now for BLD PNW. A limited number of volunteer opportunities are available in exchange for a conference ticket. Submit the volunteer sign-up form here to indicate your interest and we will get back to you by May 1st.